2 of 6 Whisk together the egg yolks and sugar in a medium-size bowl until the mixture is well blended. Heat the milk gently in a small saucepan just until it reaches simmering. Remove the saucepan from the heat. 3 of 6 Whisk a small amount of the hot milk into the yolk mixture; then whisk the yolk mixture into the hot milk in the saucepan. Stir in the liqueur and vanilla. Pour the milk mixture through a fine-mesh sieve into a 4-cup glass measure to remove any cooked pieces of egg. 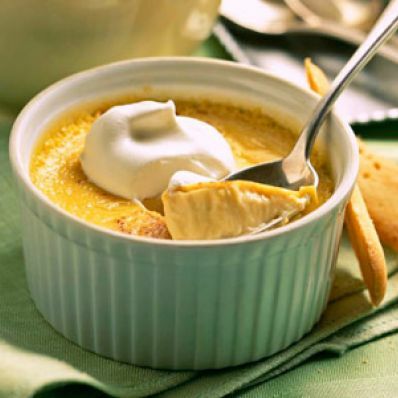 4 of 6 Pour the milk mixture into six 4-ounce ramekins or custard cups, dividing the milk mixture equally among the ramekins. Sprinkle the tops of the custards evenly with the nutmeg. 5 of 6 Place the ramekins in a 9 x 9 x 2-inch baking dish. Place baking dish with ramekins on middle rack in oven. Carefully pour enough hot water, about 4 cups, into baking dish to come halfway up the sides of the ramekins. 6 of 6 Bake pots de creme in water bath in 325 degree F oven for 35 minutes or until centers are just set. Remove baking dish from oven; remove ramekins from water bath to cooling racks. Refrigerate until thoroughly chilled, 3 hours or overnight. Makes 6 servings.